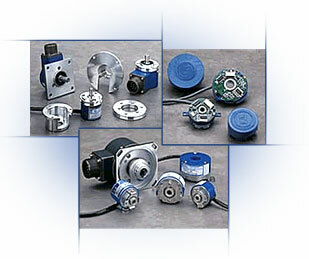 Positioning and velocity sensing for precision motors and motion control. Incremental encoders generate pulses in a frequency proportional to the rotational speed.The encoders can be used for speed control, position control, or as a rotation indicator or a pulse generator of servo motors mounted in machine tools, robots, or measuring equipment. Absolute encoders output the absolute value of rotation angles.The encoders are used for position control of servo motors mounted on machine tools or robots.As shown in Figure 2, rotation slits are lined from the center on concentric circles. Slits indicates binary code strings of 2 pulses/rev from the center.Multi-turn absolute encoders memorize the rotation quantity data over one rotation. Brushless resolver and brushless synchro can be used for high accrete feedback of position and speed sensing, and pole detection of motor. Through their features of resistance for harsh environment and other reasons, they are used with motors for machine tools and robots, in steelworks.